Ben Simmons did not have a great day Saturday. The Sixers' point guard had an uninspiring performance in the team's Game 1 loss. The crowd let him know about it. He then let the crowd know how he felt about them voicing their displeasure. It went over as poorly as you would've expected. But as quickly as Philadelphia fans will turn on you, they're just as quick to open their arms back up. Simmons on Monday won the Wells Fargo Center crowd back over in a 145-123 drubbing of the Nets in Game 2 of the first-round series (see observations). Aggression seemed to be the buzzword for Simmons at practice Sunday and he made sure it wasn't just talk. "Ben's ability was driven through just a really aggressive mentality," Brett Brown said. "Connected a lot of the dots on defense and then to the [51-point third quarter] we had, was significant. When I go back and start accumulating, ‘How did we get that many points?' or ‘How did we reduce them to this many points?' driven by they had zero three-point shots, you're going to see [Simmons] featured a lot." Simmons took the ball to the rim off the opening tip. He missed the shot, but it noticeably set a tone for Simmons and the entire Sixers' offense. Simmons went on to record his second career playoff triple-double, posting 18 points (8 of 12 shooting), 12 assists and 10 rebounds. 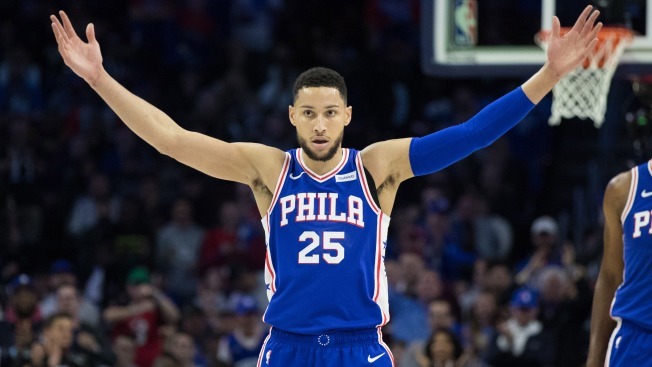 Four players in franchise history recorded a triple-double in a playoff game while shooting at least 65 percent: Wilt Chamberlain, Charles Barkley, Maurice Cheeks and now Simmons. Only three players in NBA history have averaged at least 15 points, seven rebounds and seven assists in the playoffs (minimum 10 games): Magic Johnson, LeBron James and Simmons. For as much as we've all gone over Simmons' struggles in the postseason, it's fair to note that he's had his share of special performances. Monday night will go down as one of his finest. "I mean, he's the point guard," Embiid said. "When you see him play with that type of energy, it picks you up, it lifts you up and it makes you want to play the same way. I thought tonight Ben was fantastic, and that's the energy we need for the rest of this series and the playoffs." Simmons gave the sellout crowd some energy as well. Midway through the first quarter, Simmons grabbed the rebound off a D'Angelo Russell missed three. He took it all the way to the rim with a strong finish against Jarrett Allen. On his way down the other end of the court, he raised his arms, imploring the crowd to get louder. And they obliged. It was a cool moment that signified Simmons and Sixers fans moving on from Saturday's mess. While offense is great, Simmons also got the place jumping with his defense. He's done a fantastic job on Russell, holding the All-Star guard to 16 of 41 shooting (39 percent) through two games. He shut Russell out during the Sixers' dominant third quarter. When he made a great defensive play, stealing a bad Allen pass away from Russell and finishing at the other end, he evoked the great Allen Iverson, cupping his ear to the crowd. "I was thinking about the boos from last game," Simmons said jokingly. "I got a lot of love for this city and the fans here. Every time I step on the floor I try and play as hard as I can. I was just showing that. The hustle I try and give each and every game is not only for my teammates, my family, it's for the city." All seems to be forgiven. Sixers Talk Podcast: Too early to consider a starting lineup change?